Famous the world over for playing various villainous characters in a series of Kung Fu and Wuxia movies all directed by Chang Cheh, Lu Feng (sometimes billed as Chu Lu Feng) was one part of the team of five actors popularized in a 1978 motion picture titled THE FIVE VENOMS (in America as FIVE DEADLY VENOMS). Under Chang Cheh's guidance Lu Feng was part of Chang's 4th Generation of movie stars that gained massive popularity around the world in a series of varied action pictures featuring some of the most dizzying, dazzling, and creatively gory action you've ever seen. Master Lu has since moved exclusively behind the camera, still working in the industry that brought him prominence on the international market. The famed Shaw Brothers Studios may be closed and the Five Venoms have long since disbanded (working in some capacity; or passed away in the case of Chiang Sheng), but the films live on. Below is a lengthy, career spanning discussion with one of Hong Kong cinema's best loved old-school actors, and one of the industry's greatest actors of villain roles, Mr. Lu Feng. VENOMS5: Can you tell me about your childhood, when you became interested in acrobatics and martial arts? LU FENG: I grew up in a poor family. I have three older brothers. 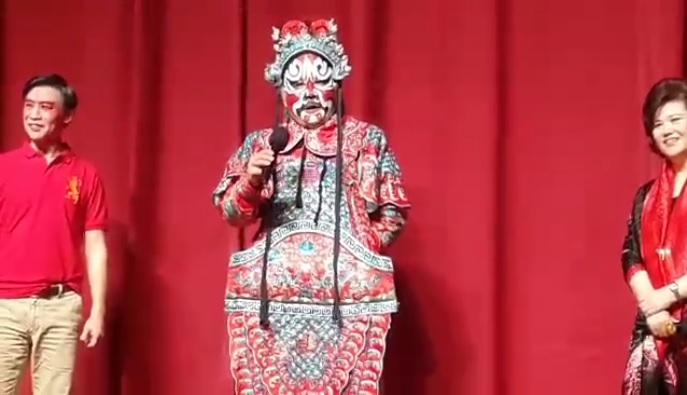 My parents couldn't afford to raise so many children, so they sent me to Chinese opera school. The government-run schools do not charge tuition, and they pay for your food and living expenses; but you must pass the exam first. I was lucky to be accepted. Most of my childhood was spent growing up in the school community--nearly 11 years in drama school with a total of 40 other male and female students. Every day we learned about opera performances. At 5am we are up to start the day courses with the first class beginning at 5:30am. In the beginning when I was learning somersaults (tumbling) it was very hard, but this training gave me foundation that helped me in my movie career up to today. After breakfast was finished at 7:30am, I learned about weapons, knives, guns, swords, forks (Fei Cha), and other weapons. Afternoon and night was reserved for normal academic studies. This lasted nine years. The last two years was for stage performances. At that time when I was very young, there was no so-called interest in such things; it was because the family was poor, and I was sent to study acrobatics, stage performances and martial arts! V5: Did you go to the same school as Kuo Chui and Chiang Sheng? LF: The three of us--myself, Kuo Chui (Philip Kwok Chun Fung), Chiang Sheng--all studied opera, but we were not from the same school. Chiang Sheng and I learned Jiang Chinese opera (Revolutionary Opera), but Kuo Chui's was slightly different. He studied Taiwanese Opera. Since school fees are not required, the government encouraged the development of artistic talent in learning Chinese Opera. As I stated before, much of the training consisted of tumbling, juggling, and weapons. The three of us became very good at acrobatics, and I am slightly better at using weapons. For the movies, I have tried almost all the various weapons. V5: Who inspired you to get into movies and become a martial arts actor? LF: After graduating from opera school I was supposed to further my development in professional arts. 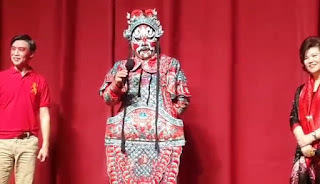 But because of the changing times, fewer and fewer people were watching Chinese Opera; the recruitment for China National Drama Theater was in decline. The movie and television industry was developing much faster so we had to find another way to survive. This was around 1975. At that time most of the martial arts staff in movies all had background in Chinese Opera. For example, Sammo Hung and Yuen Woo Ping all have a base in Chinese Opera. Fight Director Tang Chia is the same. 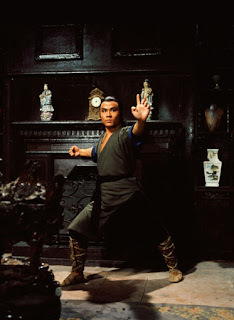 Of course, we had Sifu Lau Kar Leung who came from a genuine martial arts background but that was rare. All I can say is I stepped into the movie industry because of the decline of Chinese Opera and that my good friends lead me into this industry. I was a stuntman for a few years before Director Chang Cheh promoted me as an actor. 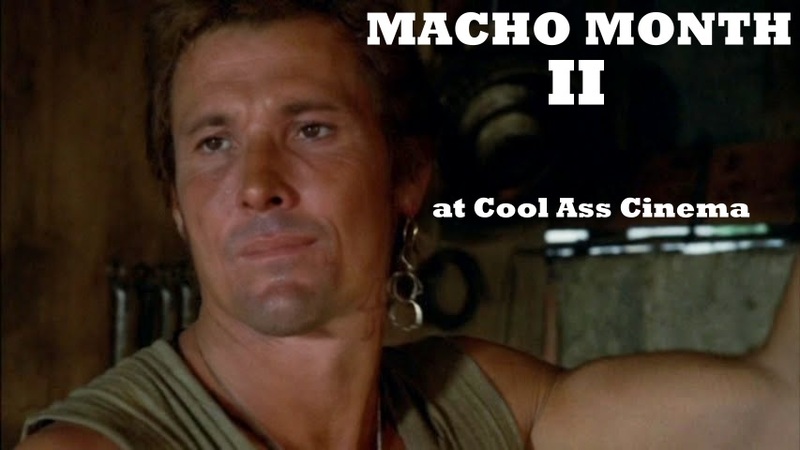 I played small roles at first, but also worked as a deputy fight coordinator. At that time Sifu Lau was just leaving Director Chang to direct his own movies. I was working at Director Chang's company when he shifted his base to Taiwan to form Chang Gong (Long Bow). Some of those films being FIVE SHAOLIN MASTERS (1974), MARCO POLO (1975), NAVAL COMMANDOS (1977)... when he closed down he took me, Chiang Sheng, Kuo Chui, and about 20-30 other men back to Shaw Brothers in Hong Kong. Lu Feng and Wang Li (right) in Chang Cheh's NEW SHAOLIN BOXERS (1976). 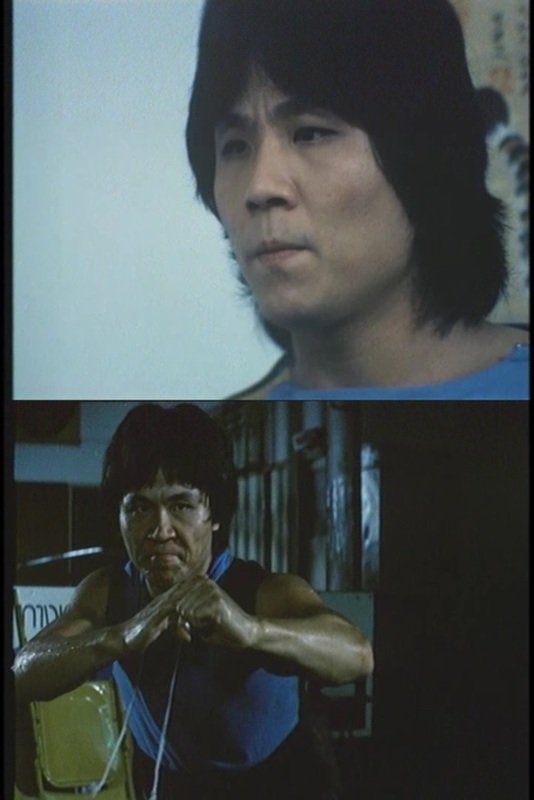 V5: You have an early fighting role in SECRET RIVALS 2 (1977) for director Ng See Yuen and his Seasonal Films Company. John Liu and Hwang Jang Lee were very popular at this time. Do you remember anything about making this film? Wang Li appears in the same fight scenes with you. LF: When I first started in this industry it was through a friend's recommendation. I participated in some movies as a stuntman. SECRET RIVALS 2 was one of those jobs. I remember Master Yuen Woo Ping was the Fight Choreographer. Wang Li was a stuntman then too, although I don't remember working with him on that one. We did collaborate for years at Shaw's and we did become good friends. I don't recall much about the picture. I just thought John Liu and Hwang Jang Lee were great masters. I wasn't in the whole movie just when they needed a stuntman. V5: How did you first meet director Chang Cheh? LF: As I said earlier I joined Chang Cheh through a friend's recommendation. The first time was on HEAVEN, HELL, EARTH (HEAVEN AND HELL in 1975). They had changed the Chinese name but the English name stayed the same. At that time I did not know if Chang Cheh would pay much attention to us since we were just small potatoes; so I just tried to do the best job I could. I did know Master Lau Kar Leung liked me. He was still there with Chang Cheh at that time as his Fight Choreographer. He gave me a chance to show off and perhaps because of this director Chang Cheh noticed me (laughs)! V5: In 1975 this was being promoted as 'The Hell', but the production was shelved for some reason and started again with new cast and choreographers in 1977. Do you recall anything about this? LF: With HEAVEN, HELL, EARTH, I think Chang Cheh was trying to create a new style of movie--with singing, dancing, ghosts, weapons, and other elements. It didn't click with audiences. 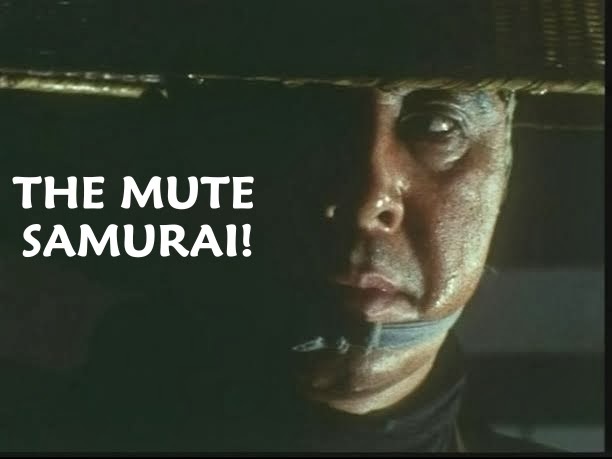 Then again, maybe Chang Cheh was ahead of his time. I think the later Hong Kong zombie movies were influenced by it to some degree. The film went through a few different titles, too; one of them was something like 'The Third Kind' which wasn't very clear (laughs)! V5: Can you discuss your experience making Chang Cheh's epic SHAOLIN TEMPLE (1976)? 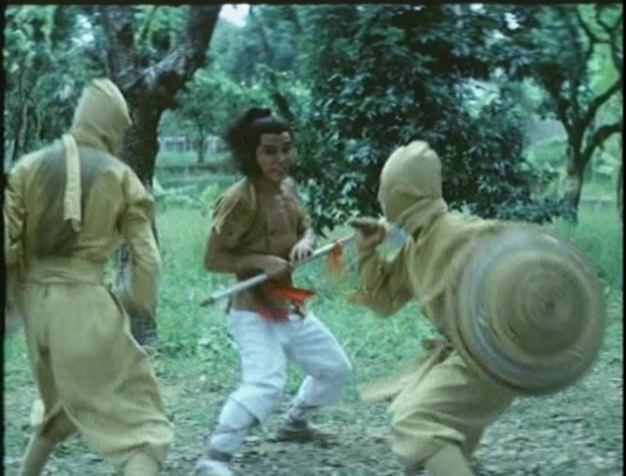 LF: SHAOLIN TEMPLE (1976) was the first time I played something resembling a real role. I only had small roles before, so I was really nervous. I remember a scene where I had to say some longer lines of dialogue and my mind suddenly went blank! I'm trembling, very scared that I can't finish the scene. I'm thinking to myself, "what an idiot!" But fortunately, I had better luck doing the martial arts sequences. I tried to do it well! Ti Lung was the big brother to us on the set. He gave us in the younger generation a lot of encouragement. V5: FIVE VENOMS (1978) was your first time as an action director? Was it a good cooperation between yourself, Leung Ting and Robert Tai? LF: FIVE VENOMS was the first time I was a Deputy Action Director. I had little experience, but I was anxious to learn. This was Leung Ting's first time as Action Director. Each move set was given to the actors just before we'd shoot them. Leung Ting had no experience, but he brought some ideas to the film; such as how Wei Pai interpreted the Snake. His action design for the Snake was not the same as traditional Snake style. The action designed by me, Robert Tai, Chiang Sheng, and Philip Kwok was very hard to put together but we had a great time doing it. In retrospect I have nothing but good memories. Tai Chi Hsien was a good brother, a very good director who worked hard for Chinese cinema. V5: FIVE VENOMS (1978) is very popular around the world. Are their any memories you can share making this famous film? LF: That year FIVE VENOMS earned a lot of money in Hong Kong and Taiwan. However, we didn't expect nor did we know our films were being embraced around the world. It was 20 years before I knew they were so popular since social media had yet to develop. Working at Shaw's was like working in manufacturing. He had his own theaters, distribution, iron works, woodworking facilities, garment factories; these were all there to complete the film. They had their own actors and directors producing dozens of movies a year. So for us it was like a job; and completing each job successfully was most important and was the mentality we all had. It was certainly my feeling at the time. We got a call sheet everyday with a list of work to be completed as well as our progress for that day. Daily some unpredictable situation would occur, often a work-related dispute. Never personal, though. For example, instead of using the traditional Snake Fist, Leung Ting decided to create a new technique. The left hand was the cobra head and the right was the tail. Unlike the Snake Fist in SNAKE IN THE EAGLE'S SHADOW (1978), nobody was familiar with this style. If we had stayed with the familiar style our film would have been completed earlier than Jackie Chan's snake fist picture. So at that time we were all in opposition of Leung's design. But director Chang Cheh decided to use the new Snake technique for the movie. It didn't affect the film's finesse although that Snake style was never used again. It did establish the uniqueness of FIVE VENOMS. In those days we were all new, so we tried so hard to do our best. Under Chang Cheh's leadership we had a good product. V5: Around the time FIVE VENOMS (1978) was in production, director Sun Chung was preparing TO KILL A MASTERMIND (1979), a film with a similar concept. Do you remember this film from that time? LF: TO KILL A MASTERMIND (1979) was a copy of Chang Cheh's FIVE VENOMS (1978). Like Chang Cheh, Sun Chung was introducing new actors--around seven--but his picture was similar to Chang's movie. I've not seen TO KILL A MASTERMIND, but the story doesn't seem as good as what Chang Cheh wrote for FIVE VENOMS. V5: One of your best works is CRIPPLED AVENGERS (1978). After a two year absence Chen Kuan Tai (above at left) returned to Shaw Brothers. You were fantastic playing his crippled son with the iron arms. Did he give you any acting advice? LF: Chen Kuan Tai was the idol of my youth. I was holding back my excitement to work with him. He was our senior then and we greatly respected him as our leader. Whether in the action or the drama parts Master Chen gave us great respect as well. He also exceeded our expectations. Chiang Sheng and I were deputy directors (assistant directors) on this film as well as action directors along with Kwok Chun Feng (Kuo Chui). Master Chen never questioned the script nor offered an opinion on the action he was given to do. He's really good! Of course, when working with Ti Lung, David Chiang, Wang Chung, Danny Lee and other predecessors in THE WILD BUNCH ON THE BEACH (SHANGHAI 13) they are the same, too. The elder class are the best brothers. V5: You are famous for playing the villain. You have played many memorable bad guys. It is hard for me to pick a favorite you are so good at playing them. Do you like playing bad guys the best? LF: According to my own experience, when I was playing the villain the box office was better. When I was the good guy it wasn't quite as good like in DESPERATE ACROBATIC TEAM (THE DAREDEVILS) (Laughs). I have a good friend who told me jokingly that I was a "natural born villain"; so maybe I'm really a bad guy (laughs)! I am fond of the Kao Chin Chuen (Gao Jin Zhong) character. I played him twice in MARKET HERO (SHAOLIN RESCUERS) and again in TWO CHAMPIONS OF SHAOLIN (1980). I prefer MARKET HERO since I won an award for it! Another bad guy role I am fond of is "Butterfly" Hua Chong in HOUSE OF TRAPS (1982). I was very handsome in that one (laughs); at least I felt handsome in it! V5: In your films you always use long weapons. Do you have a favorite? Moon Sword? Spear? Or a different weapon? LF: Because I was in Opera School, I had to learn many skills such as singing, martial arts, somersaults and weapons. I began Opera training when I was 8 years old. Since I had a loud voice more attention was paid to my singing as opposed to tumbling. By age 15 or 16 I no longer retained my child voice; some people do, but I didn't. It was no longer so clear as before. Due to this I concentrated solely on my martial arts skills, weapons and somersaults so I could be a martial arts actor in the movies. You asked me what is my best weapon... You've seen in my films that I am good at using them all (laughs)! I love using them, although they're very dangerous. V5: Going back to the singing for a moment, I've seen photos of you singing on stage the night you won your acting award in 1979. LF: Gordon Liu was accompanying me that night on stage. A special occasion! After having been out of the National Drama School for 40 years, myself and all the old students had a reunion on October 25th, 2012. I did a "painted face" performance that night in full costume (see insert photo). 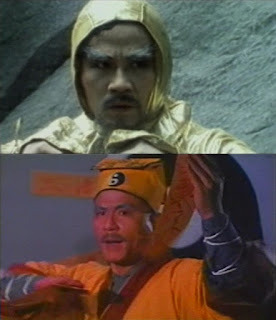 V5: My favorite is the Flying Fork (Fei Cha) weapon from MASKED AVENGERS (1981). Stunning choreography in that one. I saw it in the theater when I was a child. It was my first time seeing the Venom group on the big screen. Needless to say, I was in awe. Can you comment on this film? LF: The characters of the title are similar in meaning to "Righteous Fist". 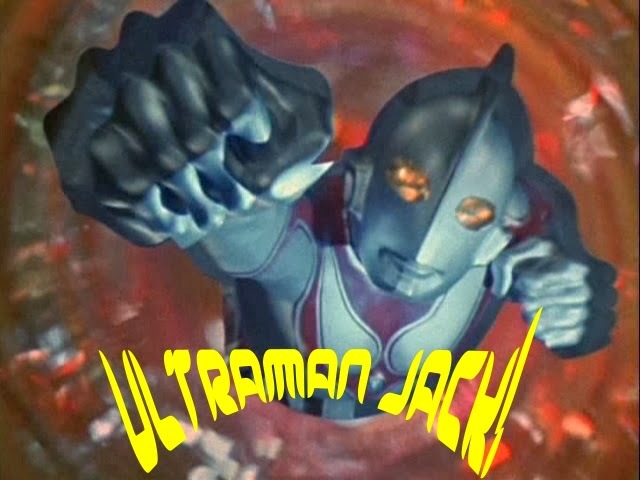 It is generally understood although the meaning is not the same since the character for righteousness, or justice, becomes the fork (trident/3-tipped head) representing the killer gang in the film. The justice comes in the form of the heroes sent to stop them. 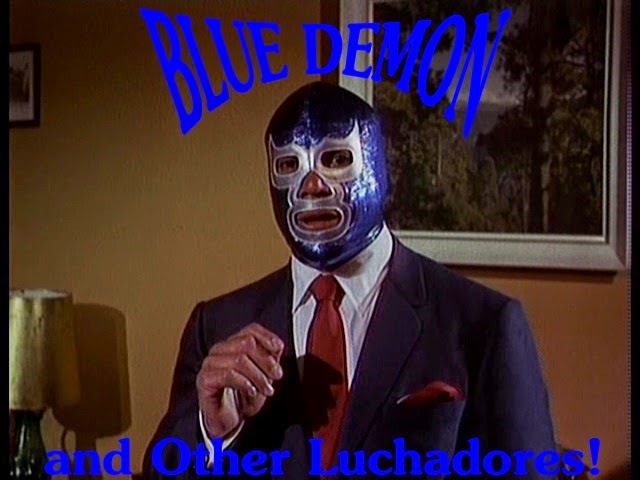 This was a much darker film than what we had been doing up to this time. Chu Ko joined our group as an action choreographer on this picture. Special mention here, my master, director Chang Cheh, is a great fan of the Chinese National Opera. Sometimes when we're filming he would sing an opera song or two (laughs)! V5: Did you know Chang Cheh's fourth generation of stars were so popular outside of Asia? LF: As I've said before, our Five Venom Group has so much love from foreign fans; we never expected it. We feel really surprised and very happy about it. We feel very honored; including me and Kwok Chun Fung. 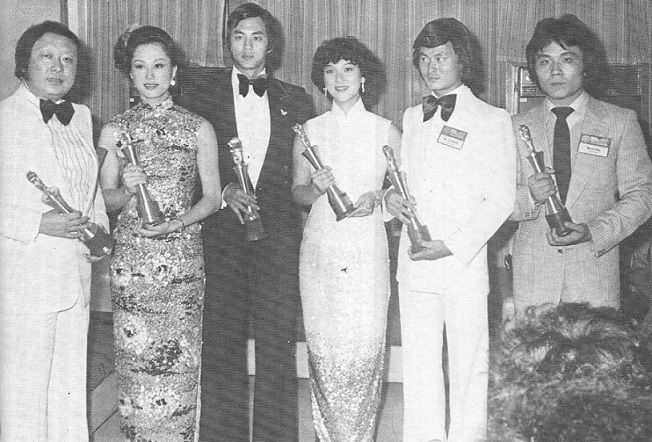 Lu Feng (far right) with his 'Best Supporting Actor' Award at the 25th Asian Film Festival in July of 1979. 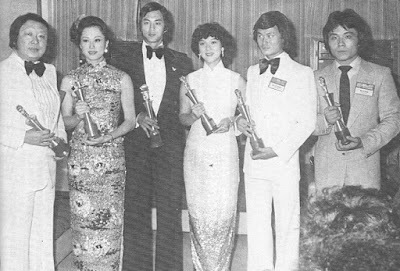 V5: How did you feel when you won the 'Best Supporting Actor In An Action Film' Award for SHAOLIN RESCUERS (1979)? You were such a strong opponent playing Kao Chin Chuen. It took all the main cast to defeat you! You played the character again in TWO CHAMPIONS OF SHAOLIN (1980). LF: Winning the "Asian Film Festival Best Supporting Actor Award" for SHAOLIN RESCUERS was the greatest honor I have had as an actor. When filming, your hardest effort to get the best result is the most fun, the most satisfying thing. Of course, the rest of our group of five friends put in hard work as well. I have told you that our movies do well as long as I am playing the villain to the end; and when many have to combine to defeat me, then I will die miserably.... because I'm too strong (laughs)! V5: Do you recall the problems while shooting TEN TIGERS OF KWANG TUNG (1980)? Chang Cheh's original story was about the 10 Tigers but the story was later re-worked to feature the young relatives of the 10 Tigers. A lot of good action footage was cut out. Fu Sheng injured himself and Wei Pai left Shaw's for Golden Harvest. LF: Director Chang cultivated the younger generation to uphold the legacy of their predecessors. This approach began with MARCO POLO (1975), Fu Sheng with Kwok Chun Fung; Ti Lung performing with Lo Mang and myself. The Kwang Tung 10 Tigers coaching the younger 5 Tigers is also the same idea. I don't really remember any problems other than normal issues that occur on set. In my memory of him, Wei Pai is a person who didn't communicate with people to the point you were completely unaware of his departure. He was a difficult personality. Director Chang's masculine cinema (Yanggang) also influenced the later generation Hong Kong triad film. That genres greatest director, John Woo, was once Chang Cheh's assistant director. You know more about the details of my films than I do (laughs), I admire that! V5: Thank you. I grew up watching them and have studied as much as possible about them over the years. As for the other members of your group, Lo Mang and Sun Chien have a different background from you, Kuo Chui and Chiang Sheng. How was it working with them? LF: Sun Chien learned Taekwondo and Lo Mang learned Nanquan (Southern Fist). When devising action that utilized their expertise, myself, Kuo Chui and Chiang Sheng tried to design action that suited their strengths. For instance, in our movies I am always armed; Kuo and Chiang were always leaping into the air, and so on. I also used tumbling and light skills but on a smaller scale. On the set the three of us would meet with director Chang to communicate before shooting. Finally, we would plan the action sequence, shooting the move sets of three people together. Whether it was only two people fighting in the move set, three people, or more than three, the decisions were made by the three of us. Completing a set is harder the more people you have since it requires more maneuvers. Before the shooting session begins we will talk about the general direction of a sequence. For example, how many people hit me, the last one who should be killed, or how my character will die; and the length of time afforded the middle portions of the fights all takes time. Lo Mang, Wei Pai, Sun Chien and others were instructed by us and didn't participate in the designing of the fights. V5: Why did the 5 Venom group split up in 1980? I asked Lo Mang about this in 2007 and his response was the audience wanted the lighter tone of Jackie Chan and comedy routines as opposed to bloody heroics. LF: There is an old Chinese proverb, "There is no never-ending feast"; meaning that any family or close friends must one day separate. We certainly tried to work together as best we could and be understanding as a team. But the fact is there were various reasons--Director Chang leaving Hong Kong for Taiwan and then China; the decline of the martial arts film genre.... however, it's a pity we oftentimes refuse to accept the reality. V5: Chiang Sheng died in 1991. Do you have a memory of him you could share? He was a close friend of Philip Kwok as well. LF: The three of us got along very well because almost everyday we studied new ways of designing martial arts moves. We had a strong bond between us. Chiang Sheng went to heaven, but it was with great sadness for us since he was such a good man and a great actor. Chiang was an interesting person. He had no temper and held no grudges. He could get along with anyone he met; but he loved to drink. Kuo Chui was a more serious actor but also a good man. 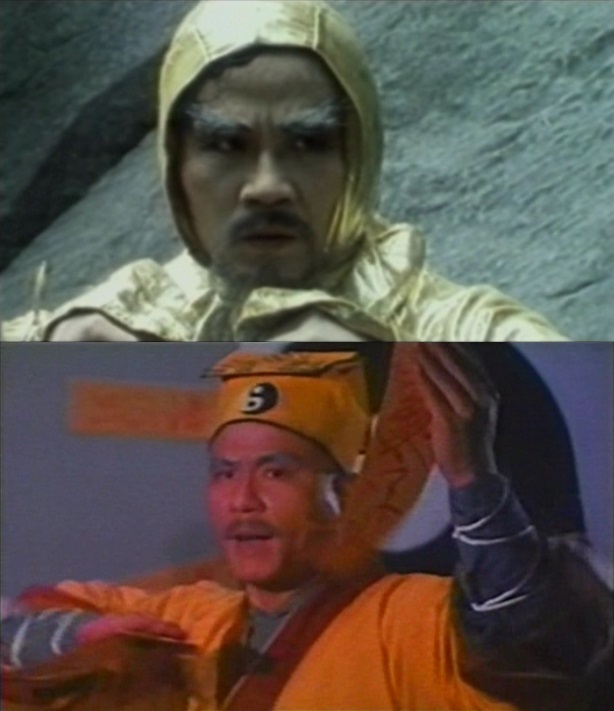 V5: Chiang was fantastic in LEGEND OF THE FOX (1980) as the main villain, Tian Gui-nong. 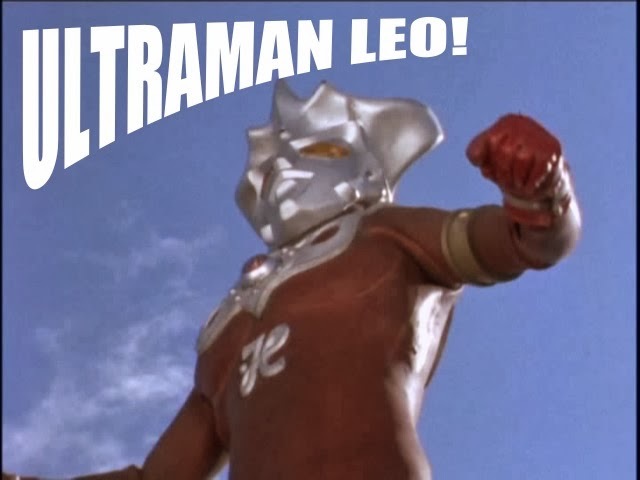 He was a much better actor than he probably ever got credit for. LF: I agree. Tian Gui-nong in THE YOUNG FLYING FOX (LEGEND OF THE FOX) was a very good role for him. He was known for playing the non-serious parts, but he played a villain beautifully; particularly because his jovial personality is the total opposite to the character. 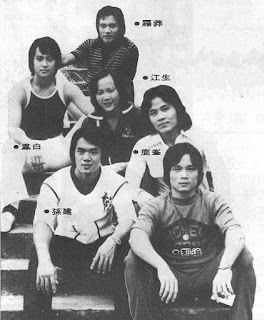 V5: Lung Tien Sheng joined your group in 1980 for the re-shooting of TEN TIGERS OF KWANG TUNG. He had a lot of charisma. 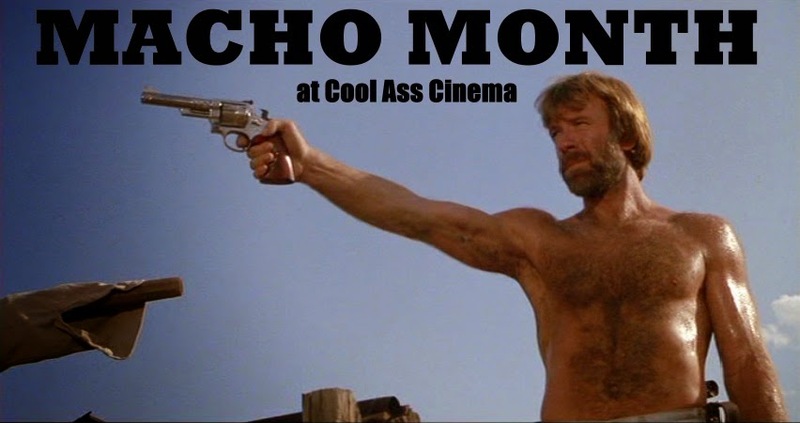 He was especially good in FLAG OF IRON (1980). Did he work well with you, Kuo Chui and Chiang Sheng? LF: Lung Tien Sheng (Long Tian Xiang) is a great actor. He brought a lot of intensity to our group. Of course, Cheng Tien Chi and Chu Ko came a short time later and were also fantastic. Cheng is my classmate. Both he and Chu Ko came from Chinese Opera background. I explained our cooperation earlier, regarding the action design. 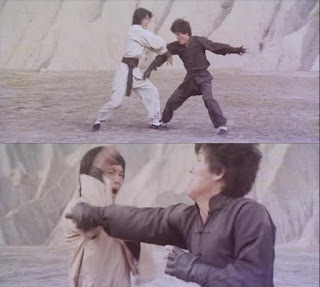 Like Lo and Sun Chien, Lung Tien Sheng didn't participate in choreographing the fights. After myself, Kuo and Chiang left Shaw Brothers, Chu Ko and Cheng Tien Chi took over as action directors at the studio. V5: What is your favorite character you played and why? LF: I said earlier my favorite should be Kao Chin Chuen, the villain of SHAOLIN RESCUERS and TWO CHAMPIONS OF SHAOLIN. As much as I truly loved playing this character my absolute favorite is the "Snow Fox", Hu Yi Dao from LEGEND OF THE FOX (1980). Hu Yi Dao was more humane than other characters I've played. I loved the heroic relationship between my character and the righteous Miao Ren-feng as played by my colleague, Kuo Chui. It was a different sort of masculine role than I normally played. Had it not been for Director Chang's mastery the interpretation might not of been as good! My next favorite would be Kao Chin Chuen, and then followed by Hua Chong in HOUSE OF TRAPS (1982). V5: Have you or any of your co-stars ever contributed ideas during shooting, or did you always follow the script as written? LF: The script, of course, is written by Chang Cheh. They're his ideas although sometimes he collaborated with Mr. Ni Kuang, a very famous writer and novelist. It is Chang's decision to shoot the picture, and his decision as to which parts we will play. The three of us--me, Kuo and Chiang Sheng--would then get together with Chang Cheh to decide the weapons we'd be using, such as the tridents in MASKED AVENGERS (1981) or the flags in FLAG OR IRON (1980); or some other elaborate weapon. Chang Cheh would have final say over the dramatic portions of the production, but in the fighting choreography the decision is ours. Us three were putting our best ideas forward as a team whether we used them or not. It was our dedication to the film that we tried to contribute only our best. V5: Can you tell me about Chang Cheh? As a man and as a filmmaker. He is my favorite director. LF: Undeniably, Chang Cheh was a pioneer of Chinese cinema. Whether it is Swordplay, Kung Fu, Triad/Gangster, Blood Brotherhood, Comedy, even Musicals, Chang Cheh's status as a forerunner still affects the Chinese film and television industries. Chang Cheh presented unique weapons in his films; the flags I mentioned earlier, as well as the "whistle stick" seen in NORTH SHAOLIN VS. SOUTH SHAOLIN (INVINCIBLE SHAOLIN).... the long stick with a chain connected to a truncheon. I've not seen this type of pole weapon used again. The tridents and lethal flags haven't been seen up to now. Chang Cheh is a great director. He came close to making one hundred movies. For me, he is the best martial arts movie director, but is the worst producer because he had no idea of handling the financing. His investment in his films was more than it cost to make them. He had no concept of the monetary end of film production. After leaving Shaw Brothers and Hong Kong, Chang came to Taiwan again with the intentions of making movies, but this time under the Chang Ho banner. I said earlier he was the best director, but he wasn't too good with handling the budget. Unfortunately, the resources in Taiwan were nothing like what we had at Shaw's. The restrictive nature of the productions in Taiwan had an impact on the quality of the films. He loved spending the money but this lack of properly allocating funds meant he was always over budget. This was Chang's one major weakness. Aside from his innovations as a filmmaker, Chang Cheh was a man of many other talents. His artistry in calligraphy in the Chinese world is famous. He wrote the famous song called 'High Green Mountains'. In Taiwan many people know this song. It described the indigenous name of Taiwan. When in Hong Kong I found out that he had also been an actor. I really do miss my master, Chang Cheh. Talking about these old times is a very pleasant thing. V5: You directed several films. Did you like directing? Was it harder or easier compared to being an action director? Please elaborate. LF: I co-directed NINJA (NINJA IN THE DEADLY TRAP) with Kwok Chun Fung and Chiang Sheng. After we finished that picture, Kwok left Chang Cheh followed later by Chiang Sheng. I stayed in his company as assistant director. In 1984 or 1985 Chang Cheh and I went to Thailand to shoot a movie called ARENA (DEATH RING). I brought in a new actor named Li Chung Yat to star. I used lots of Thai actors too. Myself and Chao Kuo were action directors on this picture. I took ARENA (see insert) to the Chinese distributors but none would take it, so it only played in Thailand that I am aware of. When it was finished we went to make THE DEMONS (THE NINE DEMONS). Around this time, Taiwan and Hong Kong Martial Arts and Action movies were deteriorating. Chang Cheh moved on to the Mainland and I went to television first as an actor and later as a director again. I remained an action choreographer, though. It's been nearly 20 years since I was an actor as I've concentrated on working behind the scenes, and mostly working in China. My job at present is strictly as an action choreographer or director. I enjoyed being both an actor and an action director; but there is a difference between the two. An actor has to follow the action he's given to perform. If an action director knows you're good at martial arts, tumbling, somersaulting, etc, he can give you a great performance. If it's an ordinary action director you will not play to your full potential. As an action choreographer you can have an unlimited imagination to play around with. You want to give the audience the most wonderful Kung Fu fighting possible. Combining the two--being both an actor and action director--I think is the best... because it is in my hands to play to the strengths in the fighting and control it; like Jackie Chan and Sammo Hung, they have been both actors and action designers; only now they are old and best suited behind the camera. V5: Do you remember SHANGHAI 13 (1984)? Can you tell me about this production? Many famous actors together including a young Andy Lau. LF: Of course, Andy is now a big Chinese movie star. THE WILD BUNCH ON THE BEACH (SHANGHAI 13) should be among his earliest film work. He had just left TVB (Hong Kong TV) when he joined the cast. All of Chang Cheh's actors from the first generation of Jimmy Wang Yu to the fifth of Cheng Tien Chi were participating. I fought and killed him in this movie! Young Andy is very diligent, dedicated, and worked very hard on this picture. The seniors worked tirelessly to deliver the best action sequences possible. In the end, SHANGHAI 13 never played in Hong Kong theaters. I don't know why. Sometime after this, Cheng Tien Chi gave up acting and became a director as well. He's the one who convinced me to get into the industry. V5: What became of Wang Li? Have you seen him recently? LF: After we left Shaw's we no longer stayed in contact. I really don't know where he is now. V5: After 1985 you did very few movies. Did you ever think of retiring? LF: No, the film industry was changing and the types of movies we were doing were in decline. Shaw's was closing down and switching to television, so I did the same. Virtually everyone has a TV set in their home. You can see a free show so why spend money to go to the theater to see a movie? At that time HK movies were becoming more and more crude and audience confidence in productions went away. V5: What is the achievement you are most proud of? LF: Normally I wouldn't say my film work was an achievement. Doing movies was just a job for me; a job I tried to do my best at every occasion. Since social media has become more developed I've discovered I have many fans so I feel very happy and proud to have brought excitement and joy to them. Secondly, being recognized with an "Asian Film Festival Best Supporting Actor" award for SHAOLIN RESCUERS, I can say for sure I achieved a lot in that movie (laughs)! V5: Compared to the old days, what is your opinion of today's Hong Kong action films? Do you ever watch your old movies? LF: Hong Kong film industry has become more diversified to meet the needs of the audience. There aren't many martial arts movies made nowadays; at least nothing compared to the old days. It's mostly comedies, gangsters or cop movies being produced. It's a shame... perhaps it's just down to different times or just a changing audience. 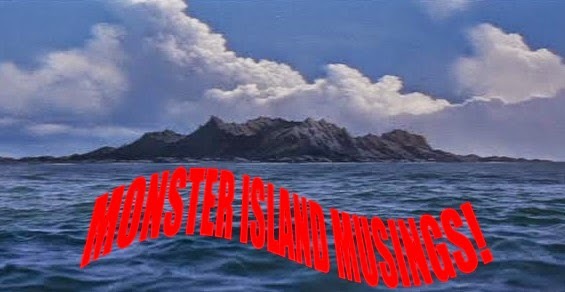 Today the film production companies are more picky about which movies can make the most money for a return investment. In the old days this was not the situation. Director Chang was always looking for new themes to shoot, new ways to make his stories, present his ideals, and interpret the emotions of the heroes as well as being innovative in the martial arts action. Chang Cheh wanted to entertain an audience with a good story as opposed to catering to a particular audience. V5: One last question, you and the rest of Chang Cheh's 4th generation of stars have a lot of fans around the world. What would you like to say to them? LF: I am very very grateful, and also deeply honored to learn the fans love me as an actor and filmmaker. I'm just trying to do my best work. I never expected to be anyone's favorite. Although our film work is over three decades old, these fans still like to remember us. I want to say to them, Thank you... really, really thank you very much, I love you! I would like to thank Mr. Lu Feng for being so generous with his time in answering questions about his career. It was a sincere honor discussing his career with him. I wish him continued success in all his future endeavors. CAC was also granted an interview with Kuo Chui (Philip Kwok), the Lizard of the 5 Venoms. You can read that interview HERE.